Tag: A Flash in the Pan? I recently collected up the flash fiction pieces I have had published in Antipodean SF through 2012 and published them in a single eBook at Smashwords. It was an interesting experience and I thought I’d note down some of the things I encountered while it was still fresh. Firstly, some background. I write on a Macbook Air using the writing software Scrivener. I have found Scrivener to be an excellent way of keeping my stories together and structured, and the product itself is very workman like. I use Dropbox to backup my working stories (and so I can work across other computers if I need to). I have been using Scrivener to create an ePub version of the Antipodean SF online magazine each month for the last few months, and it always seems to work out OK.
Smashwords doesn’t take ePub submissions directly. You have to create a Microsoft Word document according to their specifications, submit that Word document and they use their own product (the charmingly named Meatgrinder) to churn out versions of your book in lots of different formats. If that sounds a bit complicated, the first resource I’ll point you to is the Smashwords style guide. Pay particular attention to the suggestions around the licensing statements. When you get to the point of submitting your file, incorrect licensing statements can be one of the things that stops the submission going ahead. It also has excellent discussions on formatting etc, but it is a fairly long document, and if you’re anything like me you’ll probably be too impatient to read the instructions. Don’t create section breaks between parts of your document, create page breaks. Section breaks do weird things in the Meatgrinder process, including inserting superfluous blank pages. Page breaks seem to work fine. Switch your line spacing to single space (mine was set at 1.2 by default). While the line spacing won’t get caught in your initial submission, anything other than single spacing seems to get flagged as a problem that won’t allow your book to achieve “Premium” status (i.e. distributed to places like Apple etc). When creating the Antipodean SF ePub files, I let Scrivener create a table of contents and it was all good. Because of the Smashwords Word document process, this doesn’t work. I achieved a pretty good manual TOC by inserting a TOC page into my Scrivener manuscript and using Scrivener links to connect each line item in the TOC to the appropriate title in the document. When the Word document is generated, this seems to create all the appropriate links and TOC information that Meatgrinder needs. I had a few of the normal issues you might expect getting the paragraph formatting correct, setting to single space, indenting, no gaps between paragraphs etc. The main issue I faced here was that the layout in the Word document (which all seemed fine) didn’t seem to translate into the right format for the ePub version. In particular, the first line indenting (which was absolutely fine in the Word document) seemed to randomly not work in the ePub version generated by Smashwords. I noticed in particular that paragraphs that started off with speech seemed to always be effected. The first thing I needed to do was make sure that the autocorrect settings in Word weren’t attempting to switch normal quotes into “smart quotes”. That seemed to have an impact. The other thing I did was go into Word and open the “Normal” paragraph style and modify it so that the underlying style had all the right formatting elements (single space, no gaps between paragraphs etc), then reapply that style to the text. This was a little manual and time consuming but it did the trick. I think sometimes paragraph formatting from Scrivener might be applied to text without changing the underlying Word paragraph style, and Smashwords seems to take some of its cues from the underlying style. Now, when it comes to covers you upload the cover to Smashwords separately from the Word document, so you don’t have to worry about inserting it into Scrivener. I need to be clear here – I have no artist ability whatsoever. My sense of aesthetics seems to be entirely out of kilter with mainstream society. I have no advice to give you re: an artistic creation that will draw the punters in. I will say that relatively recently the pixel dimension requirements changed to take into account higher resolution screens. Smashwords wants rectangles with the width at least 1400 pixels and the height greater than the width. I went to the online cover designer site (My eCover Maker) and created my cover for about $5. Yes, I know it shows. I don’t really warrant or recommend that site in particular – I just registered for free for the “pay as you go” option and made sure I paid using PayPal to keep it all at arms length. Also, if you do go that way make sure you are 100% happy with the cover before you “generate” it – if you find you need to make a couple of small adjustments once you’ve seen the final product, that’s another $5. Once you’ve uploaded the book and it passes the automatic checks, it is available through Smashwords. However, Smashwords has a second level of publishing, the “Premium Catalogue”, which requires a more precise adherence to the Smashwords style guidelines. This was the spot where some of my line spacing and paragraph formatting issues were tagged. It takes several days for them to review a book, so don’t expect instant turn around. Once your book is approved for the Premium Catalogue, it is also shipped to other online distributors such as Apple, Barnes and Noble etc. This isn’t quite as important to me, the point of publishing A Flash in the Pan? 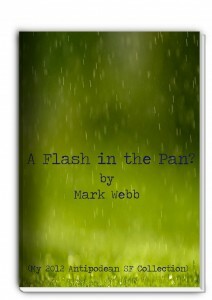 was to collect my flash fiction in one place for 2012 and to try out the Smashwords process. If you were self publishing a full novel, getting this status would be much more important. At the time of writing my book is available on Smashwords and I’ve made the adjustments that Smashwords requires for the Premium Catalogue (although it hasn’t been reassessed as yet). I used the Smashwords ISBN manager to assign my work an ISBN. Not really much more to say on this, of course if you’re managing your own publishing house you probably will bring your own ISBN number to the party, but for a simple self publishing job the Smashwords process seems fine. When checking the ePub output from Meatgrinder, I found the Adobe Digital Editions provided the most convenient option (as recommended on the Smashwords site). Short of loading it onto the iPad of course (which is just a bit fiddly – download the ePub, move it over to iTunes, plug in the iPad, sync it and repeat every time you make a change). For the mobi version, it was pretty much check it on the Kindle. All three documents remain copyright me etc, but hopefully they will help show the process I’ve been through. So, there are some of my thoughts on the Scrivener to Smashwords process. What about you? I’d love to hear some stories, hints and tricks in the comments section. I’ve also included a brief author’s note under each story just to give you a feel for what I was thinking when I was writing. It’s free, so if you missed any of my stories through the year (or just want to be able to enjoy them again and again! ), feel free to go and download a copy in one of the myriad of formats that Smashwords supports. I might write a separate post on the process of taking a manuscript on Scrivener and getting it published on Smashwords. It took me quite a few goes to get it right. My thanks to “BluntChisel” who read and reviewed the collection within 12 hours of me publishing it! I’ve never met you BluntChisel, but seeing your review made my day. Details of all my publications can be found at my bibliography.